Indie games. Symbolism. Metaphor. These go together as often as bacon, eggs, and toast. It can be part of the indie charm though. The Stillness of the Wind is a farming sim at its core, but layered on top of the gameplay is a narrative that paints a picture of the world beyond the farm. That world sounds bleak and cold. In the launch trailer, we really only see the farm that the game takes place on. The visual design of the farm acts as a constant reminder of the world just beyond its gates. 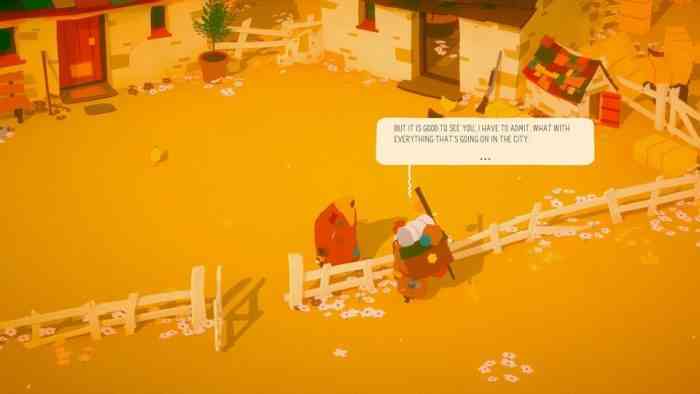 The game follows Talma, “a goat-herding grandma” who leads a simple farming life in her old age. She often receives letters from her children, grandchildren, and friends, all of which have left Talma’s small town in pursuit of their own lives. These letters do not tell tales of fulfillment, however. They often speak of fondness of their past or disturbing details of their present. Over Talma’s life, her town’s population has dwindled as a result of the residents leaving. Now, only she remains. As far as the gameplay goes, we have seen similarities from Stardew Valley, Harvest Moon, and Farm Together. Plant seeds, water seeds, harvest vegetables, feed livestock, make cheese, trade produce, etc,. Other than Talma, the only other person we see is a travelling merchant, presumably the only human interaction she gets. Like I said above, the charm and narrative of the game seems to be its biggest draw. Only you can decide if that is enough for you. The Stillness of the Wind is out now for PC, Nintendo Switch, and IOS. Will you be picking up the Stillness of the Wind? Let us know in the comments.